We are excited to kick off our 25th anniversary year with this unique celebration of women," says Sonia Jacobson, founder and executive director of Suited for Success/Dress for Success Miami. "We are so grateful to the Miamicommunity for helping us reach this milestone, and to partners like Bacardi who make it possible for us to continue empowering women across Miami-Dade County." 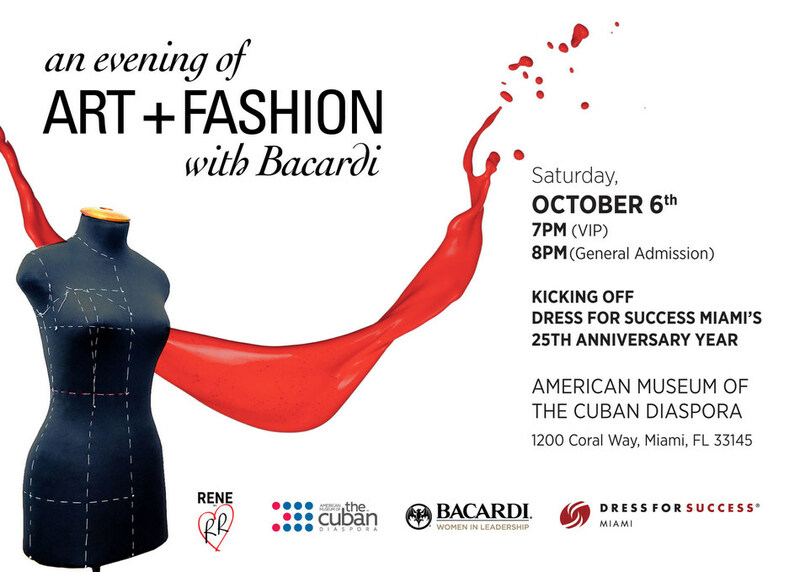 Tickets for the Bacardi Evening of Art & Fashion are $75 per person for general admission and $199 per person for VIP. VIP tickets include access one hour prior to doors opening, Rene by RR fashion show, and the private cognac, whisky and cigar lounge. Must be 21+ years of age to attend. Net proceeds from the event will benefit Dress for Success Miami. The event is being produced by Charlene Parsons, director of the Fashion Department at Miami International Universityof Arts & Design.